According to the obituary printed after his death, Johann Sebastian Bach composed most of his organ works in Weimar, where he worked between 1708 and 1717. This is not surprising, since after his appointment at Weimar his duties did not involve the composition of works for the organ. His years as organist there witnessed a tremendous development in his compositional style, particularly in the realm of freely composed preludes and fugues. Scholars believe Bach began this work while in Weimar, and completed it probably in 1712-1723. Bach's omission of the B flat from the key signature (it appears instead as an accidental) has prompted the nickname "Dorian," but it is clearly minor, not truly Dorian. The lively toccata is, as one would expect, a great vehicle for the demonstration of digital dexterity, but its square rhythms mark it as an early work. Bach seems to have been influenced by the north German school in his use of two manuals for the toccata. The fugue is the real prize of this work; its weight makes the preceding toccata seem superfluous. 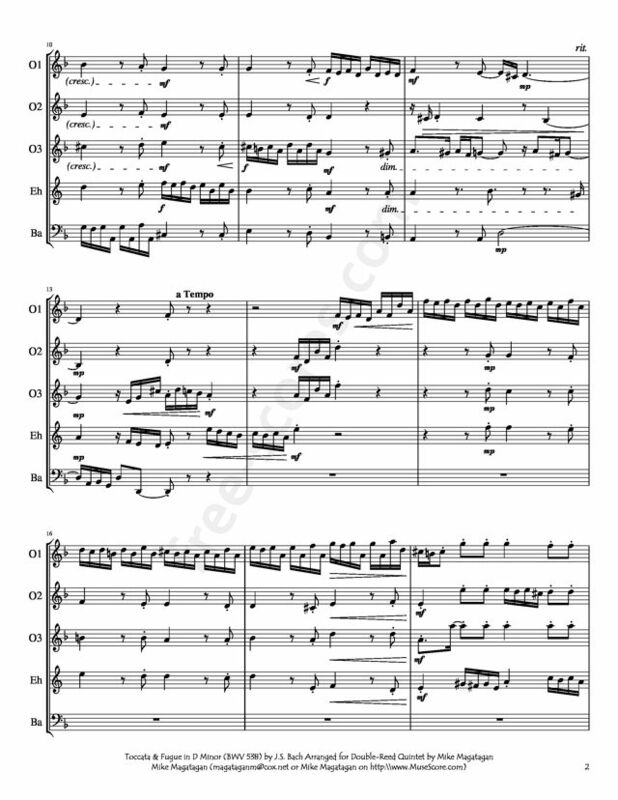 Striking stylistic contrasts abound in the fugue, with an Italianate, vocal-style subject and numerous repeated chords, another nod to the north German school. 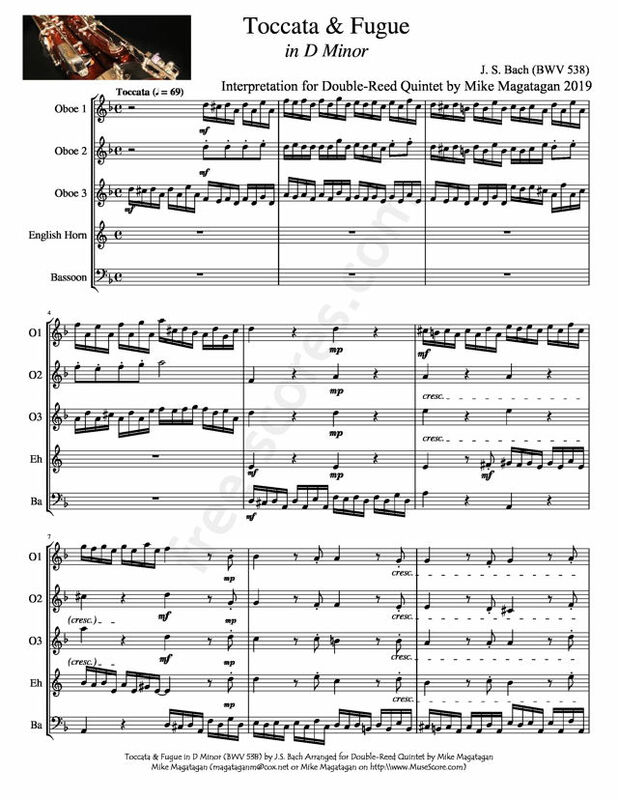 At 222 measures, it is one of the composer's longest fugues, over half of it being dedicated to intense episodic development. In the exposition, we hear four entries of the subject, a seven-measure, syncopated theme, each paired with one of two countersubjects. A counter-exposition follows, reversing the order of the entries, placing the dominant-level answers before the tonic entries as the counterpoint loosens a bit. The four entries in the developmental segment, the first and third of which initiate brief canons, explore various harmonies. In the recapitulation, three more entries also introduce canons and, as with earlier subject entries, maintain a dense contrapuntal structure. With one exception, episodes are not built on new material, but derive from a canonic sequence that follows the first answer in the exposition. These episodes also are canonic, but the nature of the material makes the passages sound less contrapuntal than the subject entries and emphasizes cross rhythms. Even after the final entry, with its full pedal, Bach begins another episode, this one functioning as a coda. Source: Allmusic.com (http://www.allmusic.com/composition/toccata-and-fugue- for-organ-in-d-minor-dorian-bwv-538-bc-j38-mc0002384542 ). 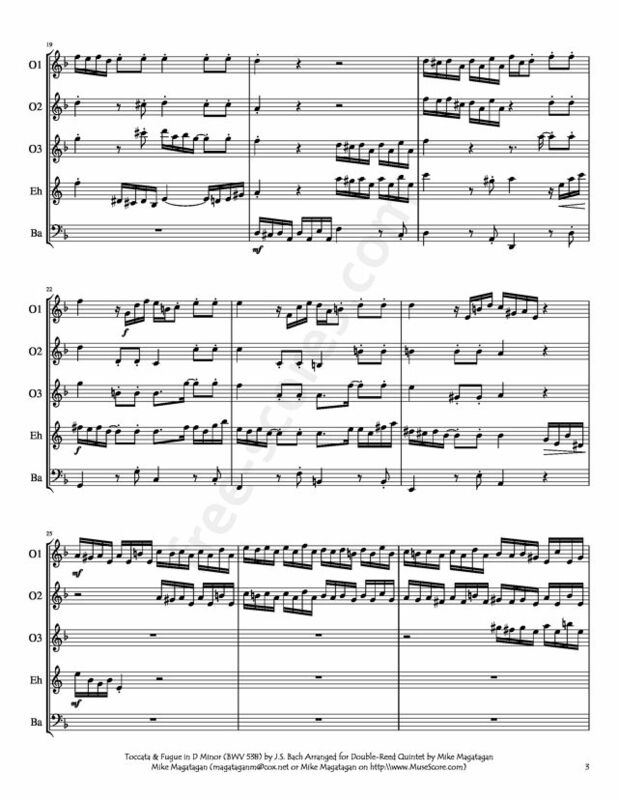 Although originally composed for Organ, I created this unique interpretation at the request of a user for Double-Reed Quintet (3 Oboes, English Horn & Bassoon).